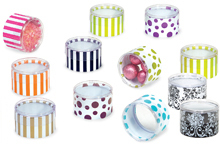 Beautiful affordable favor boxes can also serve as interesting accents for your shower, reception and birthday party. To create a stylish flair to your special occasion add bold polka dot, stripe or damask favor boxes. Now there's a way to add luxury and star quality to you next event to make it memorable! Unique favor boxes that are affordable, memorable and most of fun and reusable for your guests. Let's make it a blissful affair! !